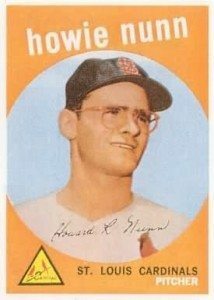 In January, I shared the story of Howie Nunn not signing. His wife was moved by the sincerity of Ron Martin. Mrs. Nunn called the hobbyist, telling him about her husband’s failing health. Weeks later comes news of Howie Nunn’s death. Additional thanks go to Ron. Two things stood out from this obituary. First, only one sentence mentioned the teams Nunn played for during his major league career. His second career as manager of a machinery and electronics company got the same space. Secondly, the survivors included his two cherished poodles. Former players are still people. They have other jobs, careers which they might have gleaned more pride and satisfaction from than their major league employment. They have pets and family. Honor the whole person when you write. Coming Tuesday: Learning from Mariner Dave Valle.